This wonderful soup is both delicious and comforting. It is easy to make and goes together quickly or can be simmered in a slow cooker. The best part is you know exactly what is in it. 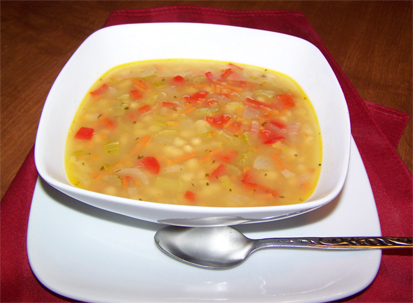 This soup is hearty enough to be served as a main course or served as a side dish. Have you ever noticed that it is the simple foods that taste best? Place oil in soup pot or dutch oven and add onion, carrot, and celery. Season with a pinch of salt to make vegetables sweat. Cook for 3 to 4 minutes and add bell pepper and finish cooking until translucent. Add remaining ingredients and simmer slowly for at least 30 minutes. That’s it! You’re done! This soup tastes great reheated too. If using a slow cooker, just saute the chopped onion, celery, carrots, and pepper in oil on top of the stove and add to slow cooker. Add remaining ingredients and let cook on low until you are ready to eat.